All viscosity standards are packaged in sealed, dark glass bottles. Net content of each bottle is 0.47 Liter (1 Pint). A label on each bottle gives the Standard Name, Lot No., Termination Date, Viscosity in Centistokes at 25.00C (77.00F)* and a statement that the standard "is prepared expressly for Paul N. Gardner Co., Inc., P.O. Box 10688, Pompano Beach, FL 33061-6688" by the Cannon Instrument Company and that data on the standard is traceable to the National Institute of Standards and Technology. A Material Safety Data Sheet (M.S.D.S.) accompanies each bottle of oil. *With the exception of the Parlin Cups whose Viscosity in Centistokes is measured at 23C in accordance with ASTM specification. ¹ These are nominal values. For the actual centistoke value of the standard, refer to the value on the bottle label. Recommended use of a standard oil to check the calibration of a Gardco produced viscosity cup is as follows: Conversion formulas are either provided with the cup to be checked or are available in the Product Leaflet for the cup. Use of standard oils available from the Paul N. Gardner Company are NOT recommended for use with cups produced by other suppliers unless the conversion formula between centistoke viscosity and efflux time as well as cup production tolerance for the particular cup in question has been furnished. For the technician who does not have automatic temperature control equipment, the following procedure may be useful with dip type cups: If the oil to be used is below temperature, place the bottle with the cap slightly loosened no closer than about one foot from an incandescent desk lamp. This will slowly raise the temperature of the oil. When within about one degree of measuring temperature, transfer the required amount of the oil to a glass container of sufficient height and diameter to accommodate the viscosity cup. (Glass is recommended due to its low rate of temperature conductance). Place the viscosity cup to be used in the oil in the glass container so that it comes to the same temperature as the oil and place a thermometer, preferably glass, in the oil which can also be used as a stirring rod. If necessary to elevate the temperature slightly, simply hold the glass snugly in the hand while stirring the contents gently and observing the change in temperature. If necessary to lower the temperature, dip the bottom of the glass container for a few seconds in water that is 10 to 20 degrees lower than measuring temperature and continue gentle stirring while the temperature slowly lowers. With a little practice it is possible to make measurements very close to the target temperature. The viscosity standards available from Gardco are precision materials. They are accurate to within 0.25% of the label value at specified temperature. This is a much closer tolerance than viscosity measuring devices normally available to users of viscosity cups. Therefore, there is no easy means of checking the standard to insure that it remains at the value listed on the label except through very careful use of the standard to insure its integrity. Included in this care should be making sure that any container used to receive the standard, as well as the cup to be checked, the thermometer and any other stirring device, be absolutely free of contaminants. Immediately following use, the standard should be returned to its labeled container and capped. If there is valid reason to question the original value of the standard, it should be replaced. The below listed standards are used by the producer of Gardco viscosity cups not only to calibrate the cups but also to certify such calibration under ANSI/NCSL Z540 or ISO/IEC 17025, ISO 9001, as applicable, and in conformance with ISO 9000, which is available as an extra cost of service. One of the requirements under such certification is the replacement of the standard on or before the termination date. Experience has shown, however, that in the absence of contamination, the standards do not materially deteriorate over an extended period of time. CAUTION: Silicone fluids should not be used to calibrate viscosity cups. These materials change the interface between the cup surface and the test material and therefore change the cup calibration. The following is taken from ASTM D445; Viscometers used for silicone fluids should be reserved for the exclusive use of such fluids. Solvent washings from these viscometers should not be used for cleaning other viscometers. Select the formula relating viscosity to time of efflux in seconds when viscosity in centistokes is known. Substitute the standard label value for centistokes for "V" in the equation and solve the equation. The resulting value is design efflux (drain) time in seconds. Note: This determined efflux time is for the standard at 25.00C (77.00F) only*. Make a minimum of three determinations with the cup in question on the applicable standard, adhering to the method of use prescribed in the product leaflet or in the applicable ASTM method, and calculate the average efflux time. Note: Pay particular attention to temperature at time of measurement. Use a thermometer that can be read to the nearest 0.1 C or 0.2 F. Experimental results should NOT be compared against determined design efflux time unless temperature at time of measurement was within +/- 0.2 of 25.0 C or +/- 0.4 of 77.0 F*. The standard oils change in viscosity between 3% and 8%, depending on the viscosity of the standard, for each degree change in temperature from 25C*. Compare the experimentally determined efflux time with the design efflux time. If experimental results were at 25.0 C or 77.0 F*, the comparison should be within the following limits: *With the exception of the Parlin Cups whose Viscosity in Centistokes is measured at 23C in accordance with ASTM specification. 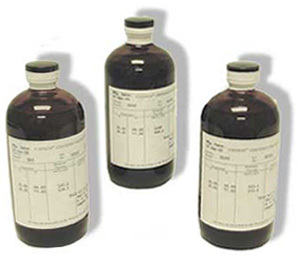 A Material Safety Data Sheet is furnished with each bottle of "G" Series Standard Oils.